This ancient surname is Scottish and loctational. It originates from the village of Aberdalgie in Perthshire, the first known recording being that of Thomas d'Aberdalgyn, who like many others, appears in the homage lists of the Interegnnum Government, of the year 1296. This short lived republican government, arguably the only one in the history of Scotland, was eventually overthrown by the famous Robert, the Bruce, in the year 1306. However whilst the Interegnnum lasted it did register all known land owners, an action that was not dissimilar to the famous Domesday Book of England, some two hundred years earlier. Furthermore as in England, early Scottish locational surnames usually carried the Norman-French preposition "de" to indicate land ownership. In this case the "de" is often fused, and like most similar names the preposition was lost after the 15th century. 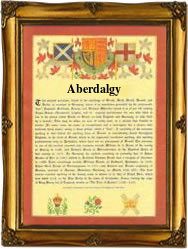 Early examples of the surname recording include in 1312 John de Aberdalgy who was in dispute over the ownership of a horse, whilst in 1321 Walter de Abirdalgy held lands by charter in the town of Ayr. It maybe his son who as Henry Aberdalgy is recorded in 3140 as being a burgess of Ayr. This was a position of honour which could be revoked if the burgess failed in his civic duties.